It’s the holiday season yet again, so that means it’s time to feature a seasonal CD at keithhirsch.com. We’ve been doing that since 2007, but never has a Target CD been the target. Well, here’s one. It’s a West German pressing of a six-person a capella group, The Western Wind, and the album is titled Caroling With The Western Wind: An Old-Fashioned Christmas. Performers on the album are Ma Prem Alimo, soprano; Janet Sullivan, soprano; William Zukof, countertenor; Lawrence Bennett, tenor; William Lyon Lee, tenor; and Elliot Levine, baritone. Joining them on An Old-Fashioned Christmas is guitarist Joseph Karpienia. 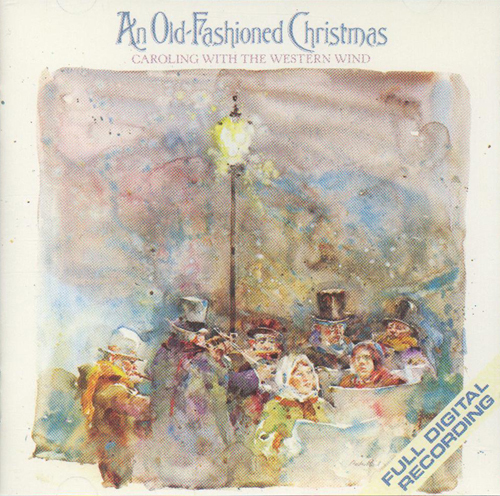 An Old-Fashioned Christmas was released on the Nonesuch label, part of WEA (Warner-Elektra-Atlantic), in 1983. 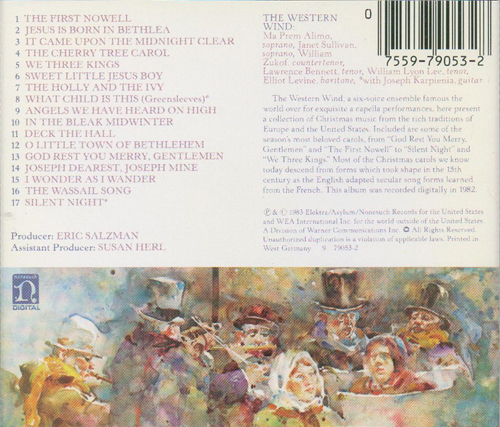 The album contains 17 classic Christmas songs, including “The First Nowell”, “Deck The Hall”, “O Little Town of Bethlehem”, and “Silent Night”. An Old-Fashioned Christmas first appeared on CD as a West German target pressing under catalog number 9 79053-2. As is typical for a Nonesuch Target CD, An Old-Fashioned Christmas has a black target pattern and bronze paint coating. The disc has “MADE IN WEST GERMANY BY POLYGRAM” printed along the perimeter, and the matrix code is “7559 79053-2 2893 282 02”. The accompanying inserts were printed in West Germany. Shown below are the inserts for An Old-Fashioned Christmas as well as the West German Target CD. Happy Holidays! The cover for Caroling With The Western Wind: An Old-Fashioned Christmas (Nonesuch, catalog number 9 79053-2). The back insert for Caroling With The Western Wind: An Old-Fashioned Christmas (Nonesuch, catalog number 9 79053-2). As noted at the bottom of the right column, this insert was printed in West Germany. 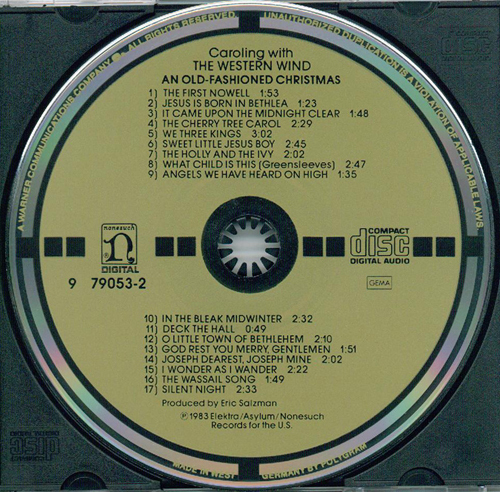 The West German Target CD pressing of Caroling With The Western Wind: An Old-Fashioned Christmas (Nonesuch, catalog number 9 79053-2). The black target and bronze coating is the unique color combination associated with West German Target CDs on the Nonesuch label. “MADE IN WEST GERMANY BY POLYGRAM” is printed along the perimeter. The matrix code is “7559 79053-2 2893 282 02”.